Looking for the best Fishing trails around Fort Smith? Find the top rated fishing trails in Fort Smith, whether you're looking for an easy short fishing trail or a long fishing trail, you'll find what you're looking for. Click on a fishing trail below to find trail descriptions, trail maps, photos, and reviews. It proved true for us that the trail is prone to flooding, even it was not rainy weather. [More later] We can also confirm that the reviews that spoke of the neglected state of the second half of the trail proved true. As to the surface: in the beginning it was finely crushed stone and gravel, alternating with hard-packed soil and grass, but later, in the second half, the crushed stone became rougher and rougher, sometimes with pieces as big as a fist: not at all good for even my 2.2" wide tires, let alone Mary's with just 35 Millimeters. The result for her were three broken spokes in her rear wheel and a flat. We also found the second half of the trail way more overgrown than the first, and all bicycling ended for us shortly after we had reached mile marker 5, when there were trail-wide and deep puddles which we dared not ride our bicycles through. The sides of the trail were too overgrown and looked too swampy there for us to try and walk our bikes around the puddles. So we just turned around. As to the bridges: they were well maintained, but I decided to stop before each of them and walk my bicycle onto them as they were not level with the bike path but had steps of 5 to 8 inches to get onto them. Conclusion: the trail is well worth riding as it leads you through a beautiful landscape, mostly under a great canopy of trees, which makes it pleasant even in the heat of a summer day, but I'd recommend the first half only. After that the surface becomes way too rough even for wide and knobby tires like my Salsa Fargo. The second part definitely needs a lot more care, cutting weeds and shrubs that overgrow it, replacing the way-too-coarse ground-stone surface with finer gravel, and filling the depressions in the trail so that it'll be rideable even after some rain. The trailhead in Poteau [since we didn't get to the other end I can't say anything about the trailhead in Wister] could also be improved: there's nothing but parking on the grass or at the side of a dirt road: a bench under a roof, a water fountain and facilities would greatly help there. But in spite of this, we really enjoyed our ride. I can tell the trail is not completely finished, but it has had MAJOR upgrades since people last reviewed it. 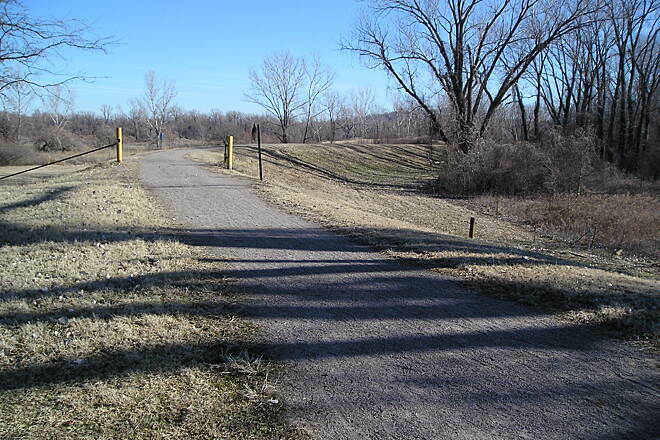 The first half of the trail (starting at the River Front Park near downtown Fort Smith and following the river) is now a nice wide concrete walkway with a pavilion and statuary near the park and benches along the trail. About mid-way through the first half of the trail there is another pavilion and a nice footbridge. There is also lighting all along this part of the trail. There is no heavy vegetation close to the trail, so no security worries or surprises. It has been years since I walked on the second half of the trail that leads to Fort Smith Park. It is still a gravel trail, but smooth and level as it was build upon old railway tracks. I'm not sure if this portion of the trail is lighted, but it does have vegetation closer to the trail, so people may not feel as secure at night. If you haven't been on this trail in a couple of years, I highly recommend it. It's a very easy trail, except the length may be a challenge for some, and a lot of it is now wheelchair accessible. I don't know wher to start, but it looks like this is the first review of this trail. I'll start by saying this is one of the top trails in the country. What they (whoever that group of folks may be) have done is a engineering marvel. I live in Missouri and I am a bicycle tourist. I have camped, backpacked and enjoyed the Arkansas scenery for many years. The way I did the trail was like this...I parked near the Northern end at a Lowe's Home Improvement. 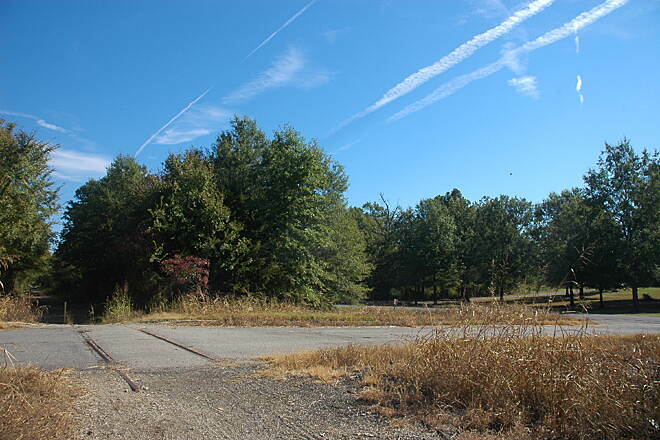 They do not allow overnight parking at the trailhead at Bella Vista or Bentonville or any trailhead at for that matter. I rode my loaded touring Bike South to Fayetteville, which was a wonderful ride. The only problem I encountered, was that the 2 campgrounds in Fayetteville did not allow tent camping of any sort. I found a RV campground 6-7 miles South of Fayetteville called the "Cow Patty" and they had no problem with a tent. The only negative thing about that is that 6-7 miles on HWY 71 which is pretty much bicycle unfriendly. After spending the night at the Cow Patty, I headed back North to my vehicle parked at Lowe's which was still in the parking lot. I did call them ahead of time and had the O.K. to park there. I'll repeat; this trail is an engineering marvel. I won't go into details because you'll have to see for yourself how they wound it through the various cities. 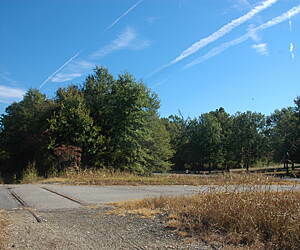 It is 95% concrete trail, seperate from the roadway. The only problem I had with the trail was some of the signage. It looks as though it was placed by someone who has never ridden the trail. This problem is compounded by the fact that the trail travels through many different cities and is composed of 19 trails which are listed on this website at the homepage for this trail. Why they don't get rid of the 19 trail names and just call it the Razorback Greenway and rename the side trails is beyond me. The worse places I saw for signage problems were in Bentonville, South of the Neil compton home through the rest of Bentonville and in Springdale. I think the powers to be would be really enlightened to find someone who has not traveled the Greenway before, and follow them and see the reaction they have to the signage. they would need to do this North and South. As it is now, the whole trail is 95% nice concrete and mostly brand new. At some point you have to get rid of the 19 trails it is composed of. I also think that the mile markers for the trail are useless, they need to be much more often, say every tenth of a mile instead of every mile. And lastly, they need to provide overnight parking at leat at the beginning, middle and ends. I give the city of Bentonville and Bella Vista zero stars for this matter. The suggestions I was given was to park up at the Missouri state line at the Walmart. I E-mailed the director of the Bentonville Parks and Recreation, David Wright. Much of the parking information I got was from him, another Bentonville Parks employee or the Bella Vista police Department. Mr. Wright was the only one that did not suggest the Walmart up at the Missouri state line and the dangerous highway I would have to navigate on my bicycle to get to the Northers end of the trail. I was told over and over, no camping alsong the trail, but as I knew I would find, homeless folks are already using the trail and camping. Especially at the Southern end in Fayetteville. Special thanks to the Lowe's in Bentonville/Bella Vista for letting me park. Even more so, Thanks to whoever engineered & designed the trail. They will always have a job. Pat yourself on the back. In closing, I would say, fix the signage, allow overnight parking and make public those locations. The trail has had tons of work done to it over the last year. New boards on the bridges and lots of local artwork. It is a nice relaxing place to run or ride my bike. 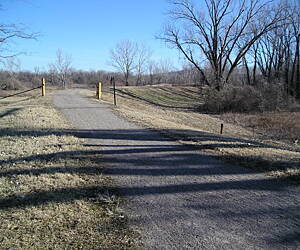 Walker Park Trail isn't that long, but it is a great access point for the Razorback Regional Greenway near the south end. There are restrooms and playgrounds and lots of parking. The trail itself goes around the soccer fields baseball fields, handball courts and pavilions. Good place for kids to ride.